Love this! Your inspiration boards are magazine worthy. Particularly like the mix of wrapping papers...I need to shake things up a bit. 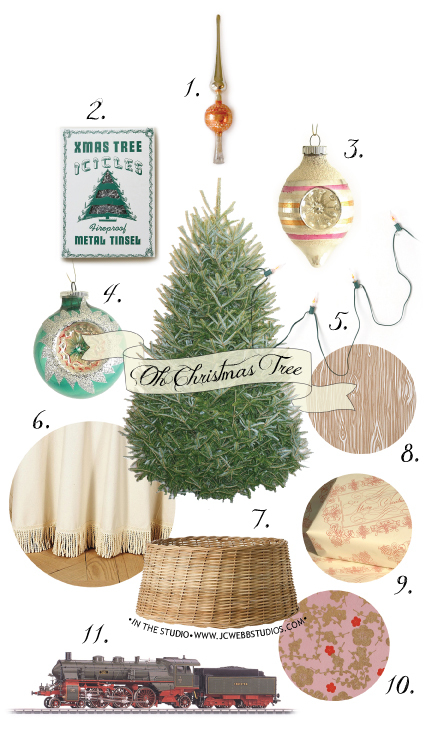 Oh, and the basket tree skirt too. Looking forward to seeing your tree. Lovely. Hope we will get to see a photo! What my husband is referring to as the 'Charlie Brown' tree has be relegated to the outdoors. I have been overruled and we will be putting up the usual full size tree, per tradition, after my daughter's birthday on the 4th. oh no haaa. Poor little tree. I think the train set will make up for the smaller tree with my girls. I have a manly stocking stuffer idea for you. They're red. ;-) Found at any True Value Hardware store, little more than $10 with tax and fit in the palm of your hand. An electrical outlet tester. But not just any outlet tester. No, this one also tests GFI's. Jennifer, I think your tree is going to be so sweet and beautiful! I can't wait to see a photo. I love table top trees, and actually just found the perfect spot for one in our house. You've inspired me! And the Marklin train - my husband had one growing up and was very upset when his parents gave it away in a rush of "downsizing." He would love your tree for sure. Happy Decorating! Well, you just inspired me to order him a Marklin train starter kit as his Christmas present this year - love it when I can do my shopping in my PJs over my morning coffee. It won't be the same as his old set, but hopefully will bring back memories. I'm sure Mischief and Mayhem will be perfect angels, right? Thanks so much for the gift idea!! Oh.... it's going to be gorgeous! I LOVE your nod to family traditions.... magical. Have a great weekend! thanks Crissy...bet your Christmas will be beyond magical. The rest of us only dream of a European holiday! Christmas parade? Sweet! Please share photos, Jennifer. Happy tree hunting! PS - Love that basket tree skirt....very cool!